1. Queen Helene Mint Julep Masque - If the results don't win you over, the price certainly will. Typically under $5, this is one of the best beauty buys. It tingles a bit when on, but it is great at leaving my skin feeling fresh and clean, while helping to minimize the appearance of pores. 2. 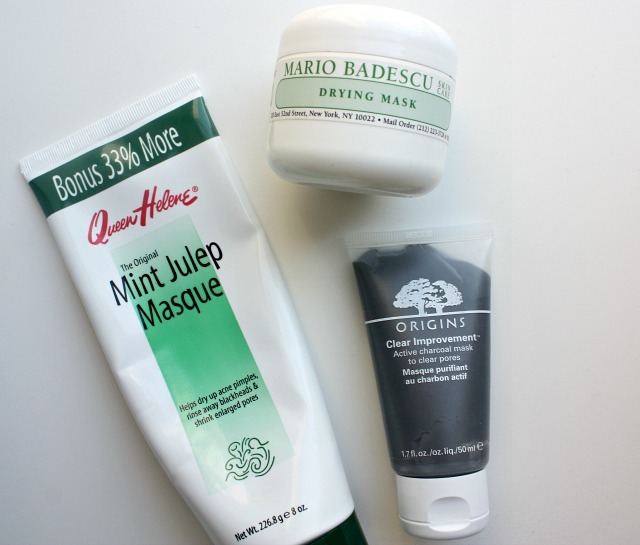 Mario Badescu Drying Mask - Never met a Mario Badescu mask I didn't love, and I don't think I ever will. Formulated with sulfur and calamine, this mask helps to dry up any blemishes and/or excess oil while healing it at the same time. Even when using other hydrating or enzyme masks, I will spot treat certain areas with this and then use other masks on the remaining parts of my face. 3. Origins Clear Improvement Mask - This was an impulse purchase in the check out line at Sephora, which can be quite the beauty gauntlet to get through. Lightweight and easy to apply, it helps to clear up my skin without stripping it of excess oil or drying it out. I need to get more into the brand - everything I try from them seems to be amazing so clearly that means I need to load up!